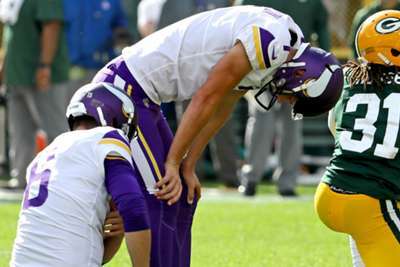 In an NFC North showdown in Green Bay, the Vikings were able to tie the Packers and send the game into overtime, only for both sides to fall short – three missed field goals from Minnesota kicker Daniel Carson, two of which were in OT, kept the scores level. Minnesota quarterback Kirk Cousins was strong in his second game as a Viking, finishing with four touchdowns, one interception for 425 passing yards. Packers quarterback Aaron Rodgers, whose leg still appeared tender from the bone bruise he sustained during last week's win, finished the day with one touchdown and no interceptions for 281 yards. The opening quarter started out with a bang as Green Bay struck first by blocking a Vikings punt. Rookie Josh Jackson jumped up to secure the ball for a defensive touchdown. The Vikings answered on the next drive with a 46-yard kick-off return that set them up for an 18-yard touchdown reception for Laquan Treadwell — his first NFL score. It did not take long for the Packers to put themselves up again, with Rodgers throwing a short pass to Davante Adams to move them up 14-7. The teams went into half-time with Green Bay leading 17-7. The second half started off in similar fashion, with Rodgers throwing a huge 34-yard pass to tight end Jimmy Graham on third down. Eventually the Packers scored on a Graham catch, but a holding penalty brought the touchdown back. The Packers had to settle for a field goal, putting the score at 20-7. Vikings fans felt a spark of life at the beginning of the fourth quarter, when a short pass from Cousins in the red zone to Stefon Diggs brought Minnesota within a score of the packers. A Mason Crosby field goal pushed the Packers up 23-14, but a huge 75-yard bomb from Cousins to Diggs gave the Vikings a big score and put them within two of the Packers. Crosby was able to secure another field goal, but the first Vikings play after they got the ball back saw Treadwell mishandle the ball and Packers safety Ha Ha Clinton-Dix intercepted the rock. That turnover led to another Packers field goal. But with less than a minute left, Cousins' pass to Adam Thielen gave the Vikings the go-ahead to go for two and tie the game. The former's lob to Diggs tied everything up at 29-apiece with 31 seconds remaining. Crosby, who was five of five for field goals on the day, was unable to make it six with four seconds left on the clock. Vikings kicker Carlson had the chance to give Minnesota their first lead of the game — and potential win — but he missed his second field goal of the game. Shockingly, Carlson had the opportunity to give the Vikings the victory with a 35-yard field goal with four seconds left on the clock, but he went wide right again in OT. The Vikings and Packers are the second set of teams to tie this season after the Pittsburgh Steelers and Cleveland Browns did in week one.